After a rough time in the original, Jack Boyd is back again in This Is the Police 2, and this time the story takes him to the town of Sharpwood, where events thrust him back into a leadership role. As his past continues to haunt him, the present once again forces him to face the darkest sides of both justice and corruption. Should you put on the badge a second time? Let’s find out. This Is the Police 2 does a great job of bridging the story between the two games. While a knowledge of the first title goes a long way towards making Jack an endearing character, the recap of sorts disguised as a letter to his family also makes for an excellent way of making Jack immediately relatable while also covering the first title’s events. Having barely escaped the mob in the first title, Jack Boyd is just trying to live his life away from the demons that haunt him. Unfortunately, his choice of residence happens to be a storage house for drugs beneath the floorboards, resulting in him being arrested by the local police department. This bring us to the new cast of characters, including the sheriff of Sharpwood, Lilly Reed. As you can imagine, Jack finds a way to convince the sheriff that they should work together and thus finds himself in charge of officers once again. The introduction of This Is the Police 2 is quite long and involves several tutorials. This wouldn’t be a problem, except for the fact that the cutscenes tend to drag on a lot longer than they should. Jon St. John reprises his role as Jack Boyd, while Sarah Hamilton does the voice work for Lilly. Both the main characters perform their lines well, but the writing itself comes across as bloated in this sequel, to the point where it robs much of the emotional impact. I could see what the developers were trying to do by making the dialogue stumble and stutter, but it often went on too long and just dragged out what should otherwise be simple story beats. I have no problem with desperate and realistic dialogue, but when you repeat something ad nauseam trying to drive a point home all the time, it loses its edge. If the script had been a little tighter, I think This Is the Police would have had far more impact from a storytelling standpoint. As it stands, the tale is both interesting and creative, but it lacks a certain bite due to the overly wordy dialogue. While the story continues at a steady pace, the familiar gameplay kicks in once Jack settles into his new role. Your day-to-day responsibilities are similar to the first title, which require you to manage a roster of officers, handle calls, and make tough decisions on the fly. For those not familiar with the first title, this results in a steady stream of management decisions and complications due to your officers being real and flawed individuals. Some people won’t go alone, don’t get along with others, or simply have vices like alcoholism you’ll need to deal with. 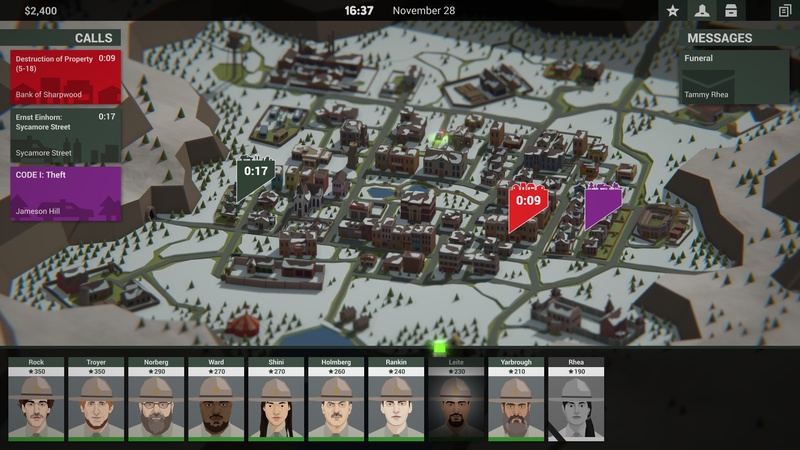 For the more complicated missions, This Is the Police 2 offers a new tactical strategy element that many will recognize from XCOM. These turn-based missions require you to move through an environment and utilize abilities or tools to subdue suspects and resolve the situation. These high-stakes missions offer a new layer of gameplay beyond the management and decision making. Combine this with the return of things like murder investigations and all new kinds of corruption, and Sharpwood offers just as much, if not more, than the wealth of things to deal with in the original title. The randomness of the game’s events, however, can lead to some brutal difficulty spikes without warning. Based on your decisions you’ll certainly find yourself with more or less officers, but other factors are outside your control and quickly lead to unwinnable scenarios. This lack of balance, combined with a story that fumbles more than it succeeds, bring down what could have been a standout sequel. Despite this, there’s still a lot to love about This Is the Police 2, you’ll just need to look past the blemishes. Like the first title, This Is the Police 2 employs a stylized approach to the menus, characters, and cutscenes. While there is certainly more expression in the simplistic models, the wide range of quality in both the voice acting and writing limits how well these cutscenes can employ the style. That being said, there seems to be more detail and color across the entire experience this time around. Sharpwood has more variety from a visual standpoint, and the extended cast helps bring some variety to the proceedings, even if some of them are more welcome than others. Ultimately, This Is the Police 2 has strong bones like its predecessor and it does lot of things right. It’s a shame that the script and story fail to really connect, and the random difficulty spikes can be a source of frustration, but fans of the original will find that the new mechanics and many of the things they loved about the original make a triumphant return.